Jodhpur is best known for the Mehrangarh Fort that looms over the city from a rocky outcrop. One of the finest forts in Rajasthan, travellers get their first glimpse of the blue houses than give Jodhpur its moniker. The 16th century wall that surrounds part of the old city harks back to a time when Jodhpur was the largest kingdom in Rajasthan. A walk through the old city will take you through a plethora of winding streets where the scent of rosewater and incense sticks fills the air. The bazaar is a shopaholic’s paradise where you shop for anything under the Jodhpur sun- saris, trumpets, trinkets, local handicrafts, jewellery, and the famous jodhpurs (riding breeches that have become a fashion statement, loose above the knee and fitted from knee to ankle). Founded by the Rathores, Jodhpur amasses its riches because of it location on a trade route between Gujarat and Delhi. Sandalwood, opium, dates, copper, and opium helped the kingdom reach new heights. Today, as you explore its sights and sounds, it isn’t hard to figure out why Jodhpur attracts tourists from the world over. The city is steeped in history and here’s a complete list of places to visit in Jodhpur while holidaying here. 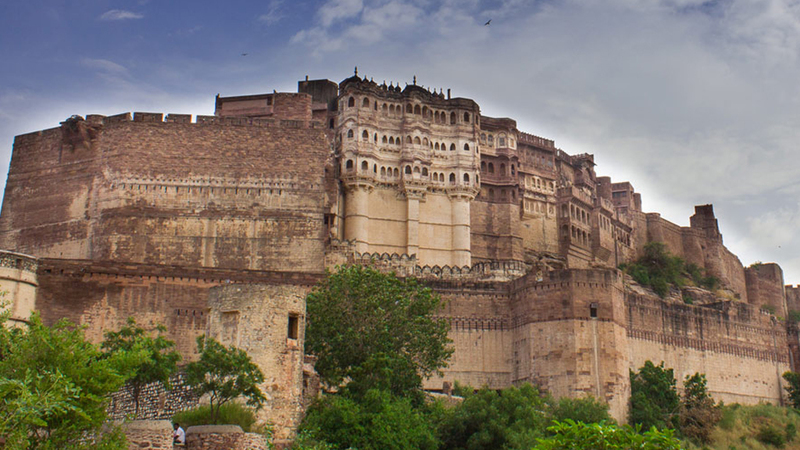 The Mehrangarh Fort sits on a 125m hill with battlements that touch the sky. It is an imposing bastion that rises above the Blue City. You enter via Jayapol (Victory Gate) into a vast complex of courtyards and palaces. All the structures here are shining examples of Rajput architecture starting with Sheesh Mahal (Palace of Mirrors). This was Maharaja Ajit Singh’s bed chamber, intricately decorated with mirror work. The ceiling is adorned with spherical European chandeliers while the arches have painted gesso panels depicting scenes from Hindu mythology. Phool Mahal (Flower Palace) was most probably a private assembly hall. There are fluted and balustered columns here reminiscent of Mughal architecture, while the lattice work is typical of Rajasthani palaces. The gold leaf paintings on the wall are beautiful and the stained glass windows add to the opulent nature of this hall. Moti Mahal (Pearl Palace) has walls that are coated with lime plaster mixed with crushed shells. This gives them an off-white pearly texture, and hence the name. Similar to Diwan-i-aam in use, this was where the Maharaja carried out his kingly duties with his ministers. This stunning room covered in frescoes and gilt from floor to ceiling served as the personal quarters of Maharaja Takhat Singh after whom it is named. Comparatively larger to the other rooms, it has lovely coloured glass windows and paintings depicting folklore, hunting and mythological scenes. No trip to the Blue City is complete without exploring one of the best places to visit in Jodhpur. 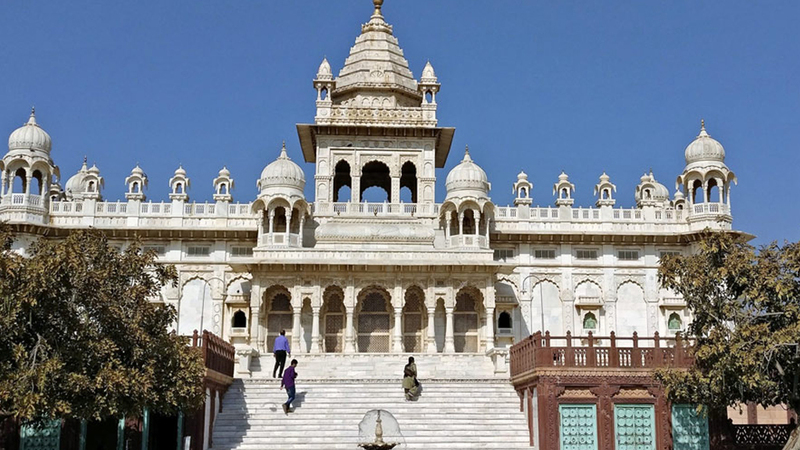 A centotaph like none other, the pristine white Jaswant Thada was built in the 19th century by Maharaja Sardar Singh in memory of his father. The beautiful onion-shaped domes of this majestic structure made of pure white marble are a great example of Rajasthani craftsmanship. 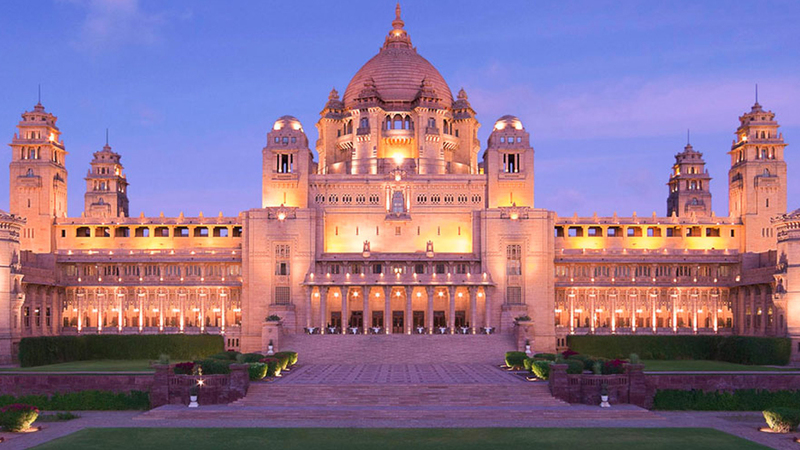 One of the world’s largest royal residences, the Umaid Bhwan Palace needs no introduction. Perched on a sprawling 26 acres on Chittar Hill on the outskirts of Jodhpur, the palace was commissioned by the King Umaid Singh to provide employment to his famine stricken subjects. The gigantic art-deco palace designed by British architect Henry Vaughan Lanchester featuring 347 rooms was finally completed in 1943. While most of the palace was converted into a luxury hotel, a part of it functions as a museum. You can see photos of the inaccessible parts of the palace here. It has a brilliant collection of weapons and clocks that is worth checking out. Don’t miss the king’s vintage car collection on display at the front lawn. For a relaxing time away from the hustle and bustle of the city, head to Mandore Gardens, located only 9 km away from the city. 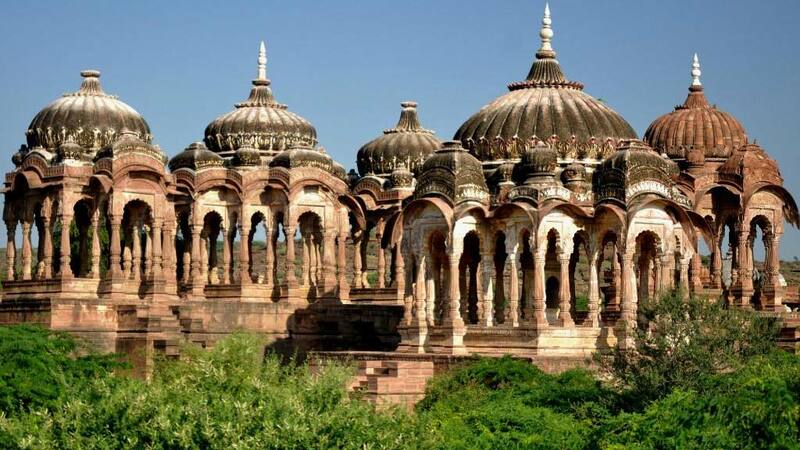 Onion-domed chhatris and verdant gardens dotted with deep-red cenotaphs of the kings of Jodhpur make for quite a visual treat. One of the most intriguing cenotaphs is that of Maharaja Dhiraj Ajit Singh that fuses the elements of Buddhist and Jain style of architecture. This magnificent pillared structure is with carved elephants and many other sculptures. It was here that 64 of Ajit Singh’s wives and concubines commited sati upon his death. Only 2 km away from the city, the Maha Mandir is another brilliant example of Rajasthani architecure. The 84 temple structure is supported by 84 intricately frescoed pillars. At the centre of the temple lies a grand altar. On the walls are adorned with paintings of fantastic yoga contortions. 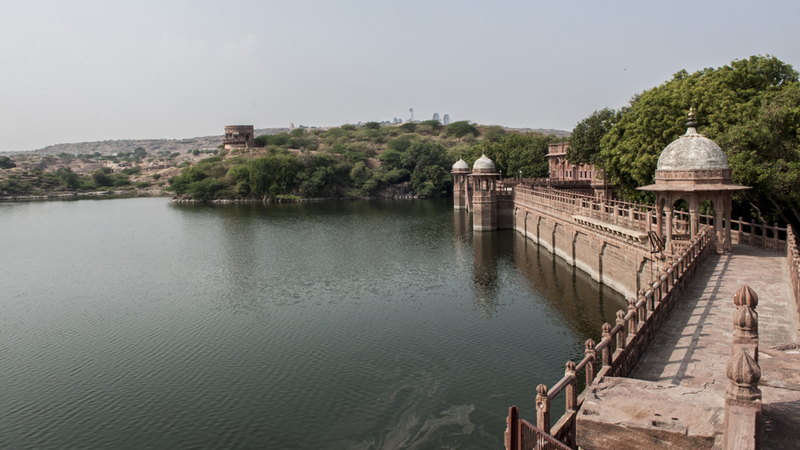 Just 5 km away from the main city, the 12th century water reservoir built by the royal family as a part of summer retreat. It makes for an picnic spot outside the city. Surrounded by all kinds of fruit trees, the summer palace next to the lake now functions as a five-star heritage hotel. What the Big Ben is to London, the Ghanta Ghar is to Jodhpur. A famous landmark in the old city, it is enclosed by the vibrant and chaotic Sadar Market. Hole-in-the wall shops bustling with activity as you walk down the narrow alleys. The distinct architecture lends this 19th century market a lovely old world charm. 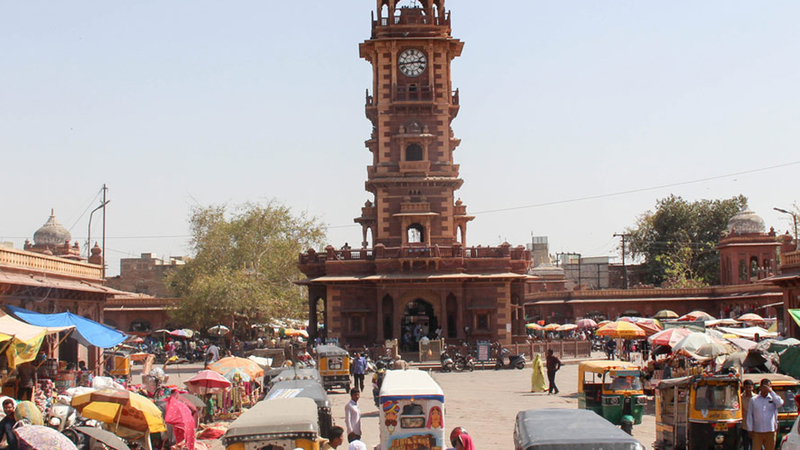 Shopaholics will find Ghanta Ghar one of the most electrifying places to visit in Jodhpur. 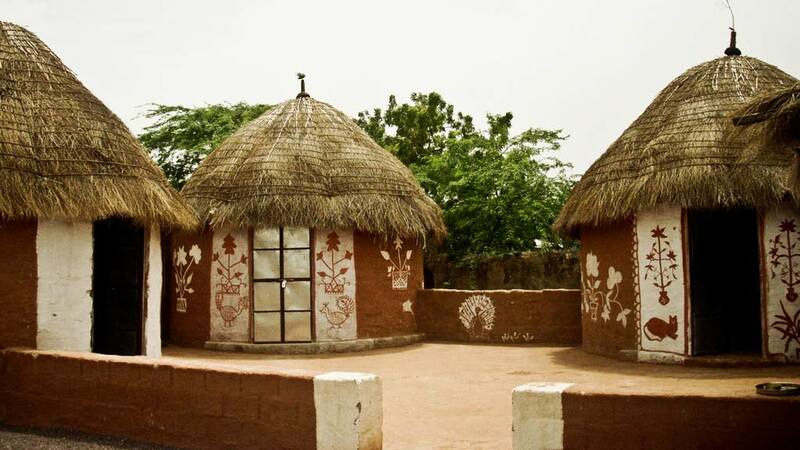 Unlike what the name suggests, Masuria Hill is actually a garden right in the heart of Jodhpur city. Lush green with beautifully manicured lawns and a variety of plants, the garden is the perfect place to get a panoramic view of Jodhpur city as the sun disappears behind the horizon. The garden even has a centuries-old temple dedicated to a local deity. An hour and a half long drive from Jodhpur, Osian, an ancient settlement is home to one of the largest cluster of temples in Rajasthan. It is an important centre of pilgrimage for Hindus as well as Jains even now. 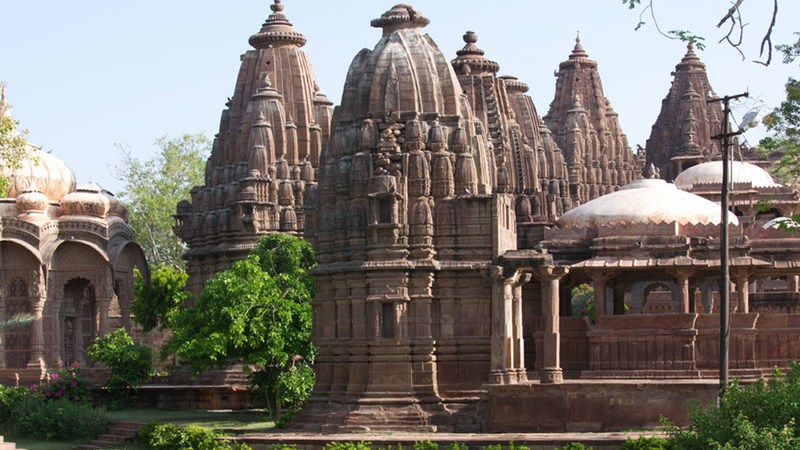 Dating back to the 8th century, the architecture and design of these temples will leave you marvelling at the skill of the hands that must have carved them. 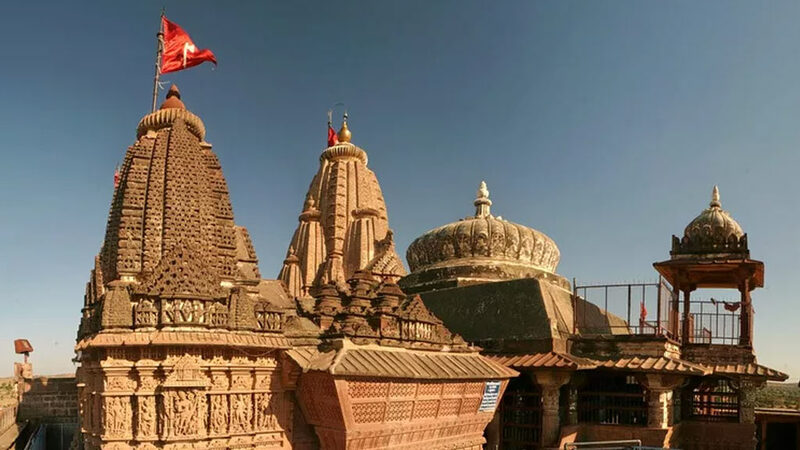 The grandest of the 18 temples in the cluster, in terms of scale and sculpture are the Surya Temple, the Sachiya Mata Temple and the Mahavira Temple. 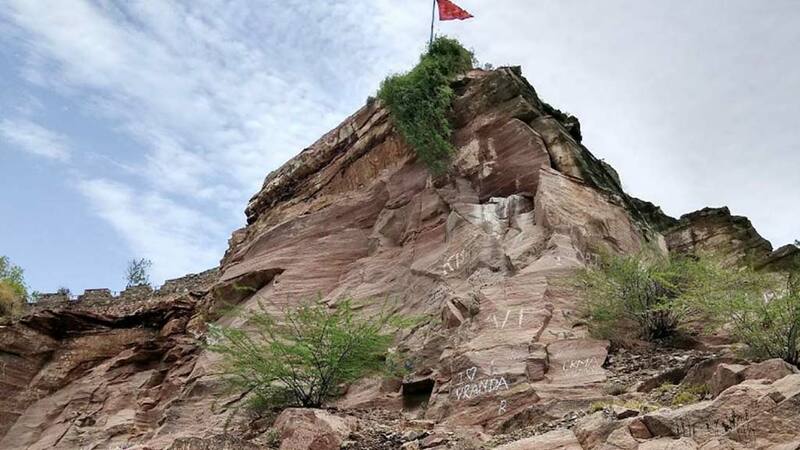 Built on top of a hill, the Sachiya Mata Temple is a living example of religious harmony since it is a place of worship for both Jains and Hindus. Dedicated to the goddess of truth, the temple complex is surrounded by nine smaller temples, each dedicated to an incarnation of Shakti. With its intricately carved arches, magnificent gateways and gorgeous statues, this temple is quite the sight. With its open-air mandapa supported by giant carved pillars, the Mahavira Temple is much larger compared to Sachiya Mata. An exquisite gateway welcomes you inside this temple dedicated to the last Jain tirthankara. The temple has distinct vaulted design on the ceilings and some very intricate carvings featuring apsaras (fairies) on its inner dome. Probably the oldest of the lot the Surya Temple was built sometime in the 10th centuy in honour of the sun god. No less than its neighbours when it comes to beauty of design, the architecture of this temple reflects a different style altogether.